I was possibly going to import two dogs from Germany (two separate breeders). Has anyone done this at same time and is it best to just fly over and pick up or have shipped direct? its much better then trying to navigate Importing for your 1st time on your own. the hard way and yet theirs some that experienced no issue. Baggage at a large savings. This would be well worth it. your partner/Friend is flying with you because I think its 1 dog per person for that super low baggage rate. Hope you find super GSD's. Thank you Border. I have good relationships with both breeders and both are very reputable. It would just be me solo and don't really have time so may just use Gradlyn. 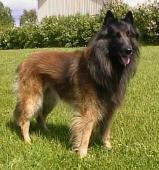 I used Delta in past but heard they are no longer shipping large breeds. Trying to research that now. Thank you again for your detailed response. You also might check into whether or not you'll need the help of a "Broker" in the U.S. Thanks Bob. We are definitely on same page and I do not feel the need to travel to Germany to confirm. Unless of course it saves hundreds of dollars then it would be worth the effort. I appreciate the advice. as extra baggage is a huge discount over shipping but once again you would have to have the time. It sounds like you know what you want to do, so good luck. are the Rolls Royce of Shipping Internationally My European friends say and I have found it to be true. works perfectly and is less expensive. us know how it works out?? You are correct. I bring my dogs into JFK without brokers. This situation was unique because I happened to be bringing two at the same time. Thanks again for the input.